In a fast-paced and changing world demanded by Industry 4.0, the continuous delivery of products and level of integration of technologies are required. This is achieved through the introduction of agile but agile itself demands changes in the way projects are managed. The role of the project manager itself is changing from a command and control to a collaborative and coaching style of leadership. Project teams on the other hand should be self-organizing and self-directed to be agile. Managing agile teams requires a different approach as the idea is to deliver workable solutions and products at a faster space. New project manager skills and competencies are required as well as ways to manage agile teams. A conceptual model is introduced, highlighting the required enablers for an agile environment. The enablers have an impact on how the agile project manager interacts with the agile team. The end result is that products are faster deployed enabling organizations to react to the changes demanded by Industry 4.0. Projects and project management have a long history. Some of the major projects undertaken by humankind delivered the Great Pyramid of Giza (2550 – 2530 BCE), the Colosseum (70 – 80), the Cathedral at Hagia Sophia (532 – 537), the Taj Mahal (1631 – 1648) and the Empire State Building (1929 – 1931) (Kozak-Holland & Procter, 2014). These civil engineering projects evolved into various other types of projects including space exploration projects and information system projects, for instance the implementation of an ERP system (Sudhaman & Thangavel, 2015). The history of formal project management does not stretch that far back, and project management was introduced in the late 1950s between the second and third Industrial Revolutions (Seymour & Hussein, 2014). A formal way was needed to manage projects and the notion of project management was born. The introduction of project management as a discipline resulted in new opportunities for researchers as well as organisations: project management standards and best practices were introduced, roles and competencies of the project manager and team members were documented and ways were created for determining the success of projects (Söderlund & Lenfle, 2013). The skills and competencies of project managers and those of project team members have also been researched and various research articles as well as competence models have been published. Some of the well-known competence models include the Project Management Institute’s Project Manager Competency Development Framework (PMCDF) (Project Management Institute, 2017c) and the International Project Management Association’s Individual Competence Baseline for Project, Programme & Portfolio Management (ICB) (International Project Management Association, 2015). The PMCDF focuses on personal and performance competences. The ICB, on the other hand, focuses on three competence areas, i.e. perspective, people and practice (Marnewick, Erasmus, & Joseph, 2016). Industry 4.0 have a disruptive impact on various industries such as manufacturing and logistics (Santos, Mehrsai, Barros, Araújo, & Ares, 2017). These disruptions are caused by various advances in technology such as the Internet of Things (IoT), wearable technology, artificial intelligence and machine learning. Traditionally, these new technologies or systems would have been implemented through projects and project management. Just as Industry 4.0 has a disruptive impact on other industries, it is evident that Industry 4.0 has a disruptive influence on project management and project teams in particular (Weber, Butschan, & Heidenreich, 2017). The disruption focuses on the way and manner that projects are implemented and team members interact with each other as well as new skills and competencies needed to manoeuvre through the 4th Industrial Revolution. Current project management practices and standards do not cater for or meet the needs of Industry 4.0. Agile project teams have already resulted in some challenges in the working environment. Some of these challenges are the co-location of teams and the cross-skilling of individual team members (Svejvig & Andersen, 2015). Industry 4.0 challenges the project management discipline in various ways. 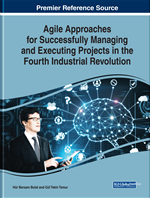 Some of these challenges are the dynamics of the project management discipline itself in Industry 4.0, the organisational structure in project-oriented organisations, the effects on the project managers’ responsibilities and roles, Industry 4.0 tools and approaches used in project management as well as agile project planning (Project Management Institute, 2018b).